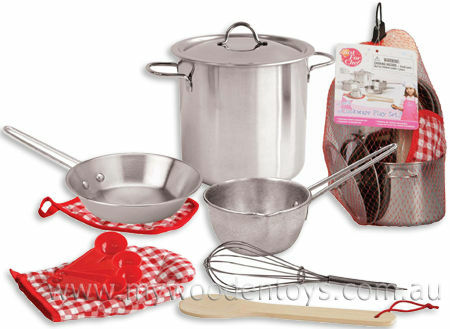 Stainless Steel Cooking Toy Playset is wonderful nine piece set including checkered padded glove and pot holder. This is is a solid well made stainless steel set with a big pot and lid, saucepan, frypan, 5 accurate plastic measuring spoons on a ring, a metal whisk (just like the real ones) and a wooden spatula. A great set that is just a small version of the real thing all contained in a net bag. Size: Big pot is 10cm high with a 10cm diameter, Spatula 22cm long, Glove 18cm long 11cm wide. We like this because: "Love that the measuring spoons are accurate and that it is all the real thing just smaller."